KASHIHARA, Nara Pref. 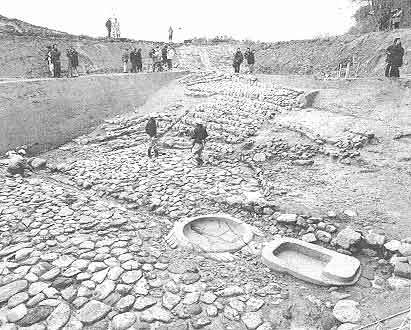 (Kyodo) Researchers have excavated an ancient stone-paved plaza featuring an elaborately sculpted stone water basin shaped like a turtle in Asuka, Nara Prefecture, according to the Asuka Village Board of Education. The remains at the Sakafu-neishi ruins are estimated to date back to the seventh century, based on the earthenware found in the area, and may have been used by Empress Saimei (594-661) for religious services, officials of the board said Wednesday. The discovery was made to the north of the remains of what is believed to be Futatsuki, a Taoist palace built on the orders of Empress Saimei during the period when turtles were considered to be divine, the officials said. "There is a strong possibility that it may have been a facility related to the Futatsuki palace, where religious activities were held," said Yoshinori Aboshi, a professor emeritus at Kansai University. The discovery could shed light on the Empress Saimei's reported love of construction critiqued in the Chronicle of Japan, the oldest official history of Japan, covering events from the mythical age of the gods to the reign of Empress Jito, which ended in 697. It is also hoped it will help clarify the activities of Empress Saimei, who is reported to have imported a great deal of Chinese and Korean culture. The plaza, located 300 meters northeast of the estimated location of another palace used by the empress, was discovered during an excavation survey by the local education board of a 750-sq. meter area in preparation for construction of a public road, the officials said. Archaeologists found the plaza to measure about 150 sq. meters and paved with stones each the size of a human head. It is situated between two stone walls on the eastern and western sides, they said, with the wall to the east shaped like a staircase, two meters tall and six meters wide. A ditch, also stone-paved and about 50 cm wide, runs across the square, the officials said. At the southern end of the ditch is a turtle-shaped water basin made of granite. The turtle's body is hollow and its head, tail and feet are clearly featured, the officials said. A separate stone bowl, located to the south of the turtle, is apparently designed to pour water  probably drawn by a wooden drainpipe from the direction of the Futatsuki palace  onto the turtle's head, which has openings in its nostrils that connect to its body. A groove in the body area allows water to trickle down toward the turtle's tail and be drained into the ditch, the officials said. Some 75 meters south of the turtle, a stone construction believed to have been used to make sake is located on a hill, about 26 meters above where the Futatsuki palace is believed to have been situated. The turtle is reportedly similar to a turtle depicted on an ancient embroidered curtain featuring Prince Shotoku (574-622) and his mother, made after the prince's death. The curtain is kept at Chugu temple in the town of Ikaruga, Nara Prefecture. Stones cut in a similar fashion to those found in the plaza have also been discovered on the hill with the stone construction thought to be used for making sake and at a site believed to be the location of Empress Saimei's palace, prompting local education board officials to surmise that the three areas were all part of a single complex.